Front to back rails replace standard beams to support pallets. Lift trucks access pallets by driving into lanes from one or both ends. In a Drive – In system, pallet loading and retrieval is from the same aisle and is used where last – in first – out (LIFO) principle is acceptable. Maximizes storage capacity against a wall. 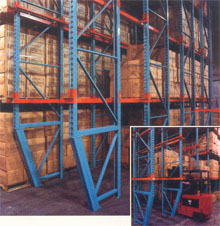 In a Drive- Thru system, pallet loading and retrieval can be from aisles at either end and is used where first-in first-out (FIFO) principle is desirable. When should you specify Drive-Through Racks? When you have seasonal items that move quickly out of your inventory. If you don't store a wide variety of loads in the rack.